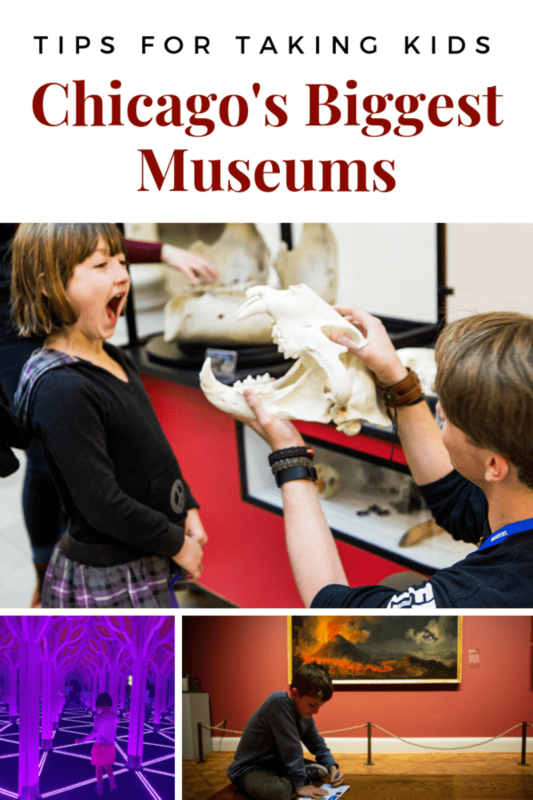 Our family trips usually include a museum or two on our itinerary. 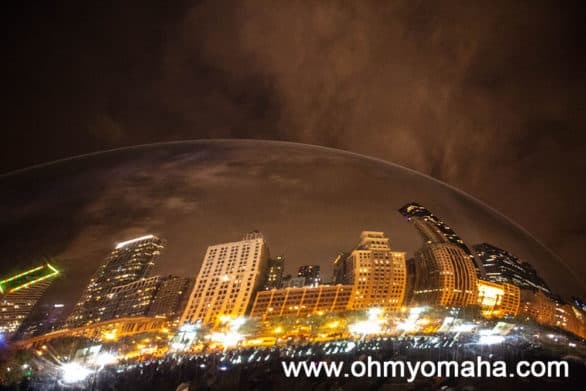 On a recent holiday weekend trip to Chicago, there was so much we wanted to see, we had a lengthy list. 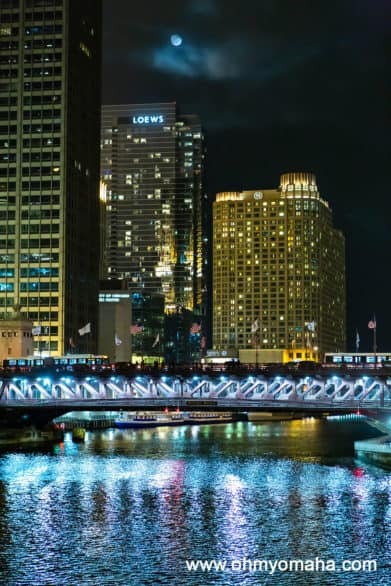 So we narrowed it down and picked three Chicago museums to visit, two where we’d get free admission thanks to the ASTC reciprocity membership. As it happens, we pick three of the biggest museums in Chicago (and the world!). However, three museums in three days? I would’t recommend it now. We went to Museum of Science & Industry, Art Institute of Chicago, and The Field Museum, and they are massive. Don’t make the mistake of trying to see them all in one trip, even if it sounds manageable. How big are the museums? The Museum of Science & Industry has 400,000 square feet of exhibit space. The Field Museum’s exhibition space is 480,000 square feet. And the Art Institute of Chicago? It has more than a million square feet of exhibition space. However, let me share some tips for visiting them, should you want to choose one or two for your next visit. Before anyone leaves any hate comments, yes, there are WAY more than three museums to see in Chicago. I know this. I agree. First time visitors, though, are probably going to be eyeing the ones the city is most known for. As it’s the largest science center in the Western Hemisphere, the Museum of Science & Industry is going to take you a whole day to visit, and even then, I doubt you’ll see and it all. The Transportation Gallery at the Museum of Science & Industry in Chicago. The museum is so large, we didn’t see all the permanent exhibits during our 5-hour visit. It was Thanksgiving Weekend, so the crowds may have been bigger than usual. 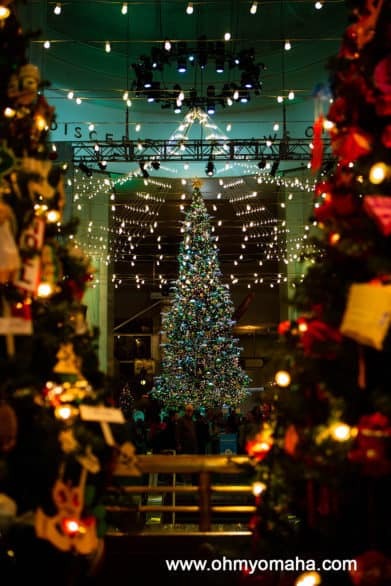 But if you visit that time of year, you’re in for a treat: The museum has trees decorated to represent countries from around the world, plus there’s the massive Grand Tree as the centerpiece. The four-story Grand Tree is located inside the Museum of Science & Industry in Chicago. 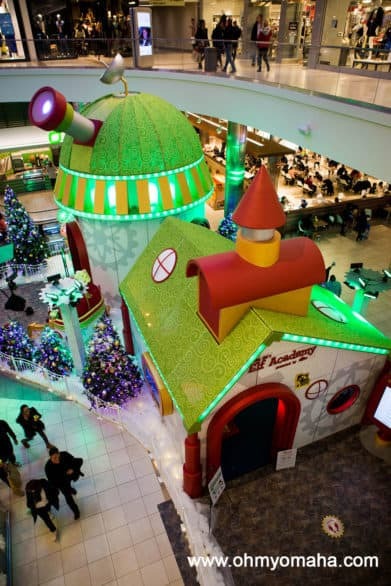 Some of the places that were the biggest hits with our 7-and 9-year-olds included the mirror maze, the build-a-toy area, and the Idea Factory, which is essentially a one-room children’s museum. The Idea Factory inside the Museum of Science and Industry is for children under the age of 10. This was just one corner of the room. The maze and playground both required timed tickets to limit crowds, so if you know you’ll want to see them, I recommend getting your tickets first thing so you’re not stuck with a really late entry time. 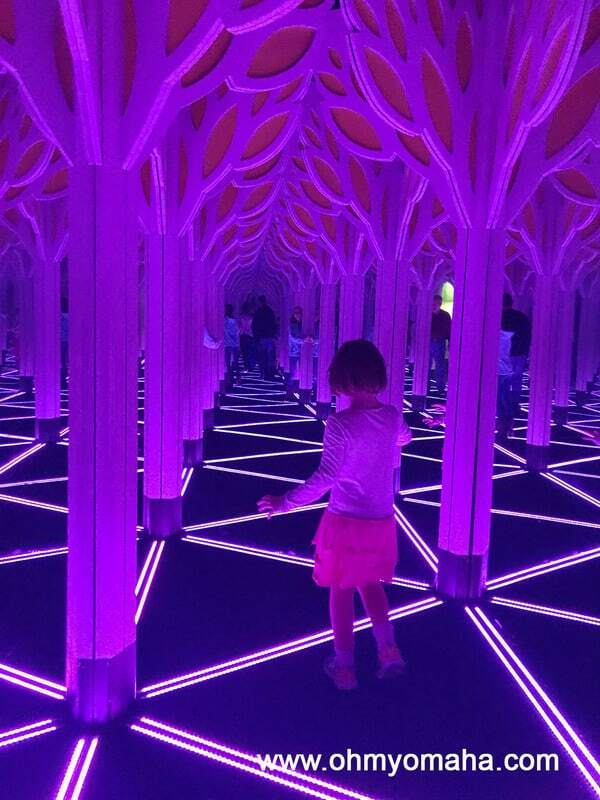 My daughter and I did the mirror maze at the Museum of Science & Industry easily, since my daughter seemed to have a knack for knowing where to turn. Your general admission ticket gets you into plenty of exhibits, including ones exploring energy, transportation and robotics, as well as the U-505 Submarine. You can opt to purchase experiences or passes to temporary exhibits (there was a Pixar one there when we went). 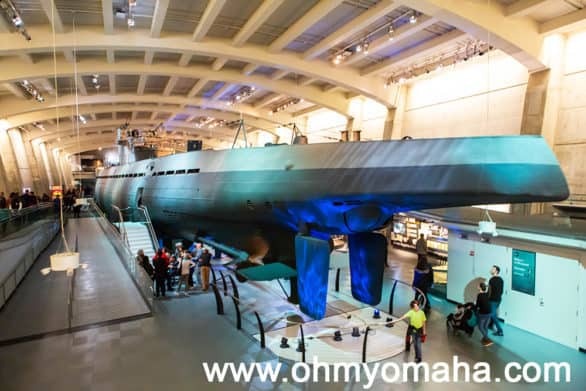 The U-505 Submarine is included with regular admission to the Museum of Science & Industry. We bought tickets to the Coal Mining Experience. It was pretty interesting, and included a little ride in a coal mining train, but for the price, I probably wouldn’t do it again with the kids. It was $40 for us. Dining tip: There are three dining options inside the museum, including an ice cream parlor. We had lunch at the Brain Food Court, which is a large cafeteria-like food court with healthy options and then your expected grilled and pasta fare. The food was pricey, as is expected at any museum, but I was impressed with the variety. Parking tip: There is a parking garage at the museum that is$22 for parking. I heard there are parking lots within walking distance in neighborhoods, but I can’t vouch for any. I recommend taking public transportation, taxi or an Uber to the museum. Playing around with a light and color exhibit at the Museum of Science & Industry in Chicago. 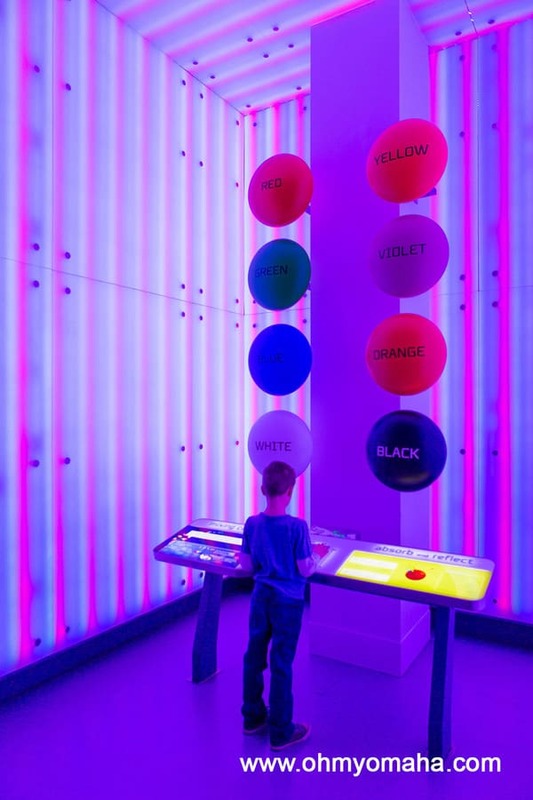 Reciprocal membership alert: If you are a member of Omaha Children’s Museum or another science center that’s likely a member of ASTC, you receive admission for four to Museum of Science & Industry. This is a huge savings. 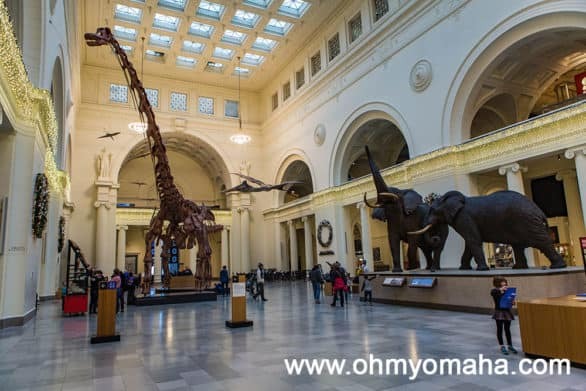 The Field Museum is on par with the big museums of the world like the Smithsonian. So, it’s huge and it’s full of a ton of exhibits in botany, zoology, anthropology and geology. Keep your expectations in check: You’re not going to see it all in one day. 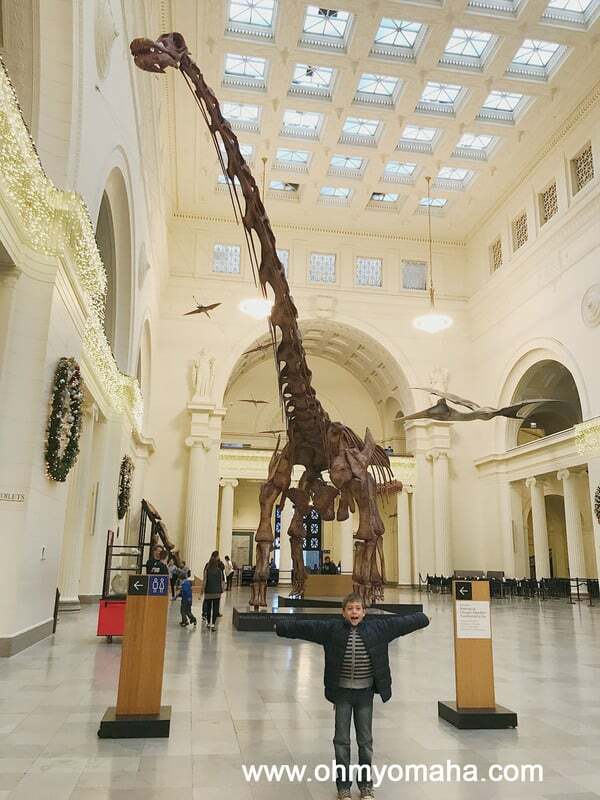 My son in front of Máximo the titanosaur at The Field Museum. The titanosaur is the largest dinosaur to ever live. Since this is a cast of fossils, you can touch Máximo! A docent recommended our family take the one-hour tour with the kids. It took us to several exhibits in the museum and gave us a ton of interesting information. One kid was totally into it, the other was not. So, maybe it’s a good idea for families? The Discovery Squad at The Field Museum help kids better understand science and natural history by letting kids see specimens up close. My daughter loved the experience. The docent tour did take us to see SUE, the T. rex that the museum is famous for. 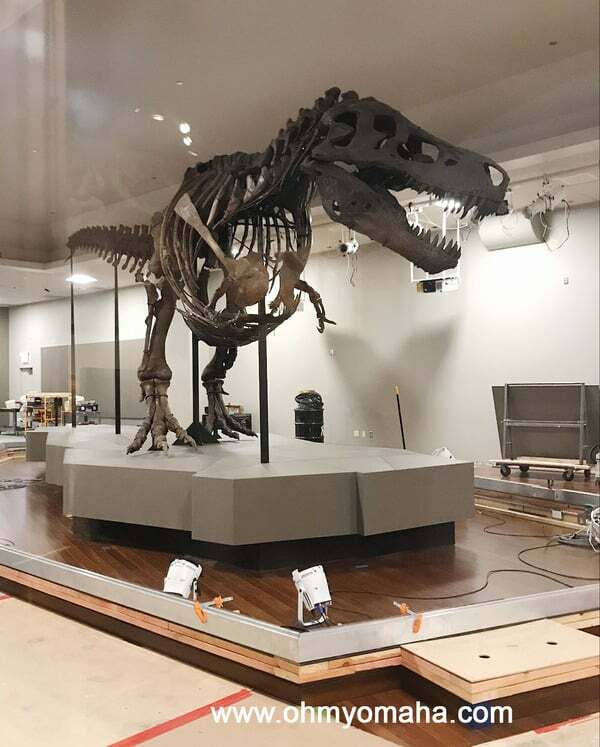 The museum is outfitting a new room for the skeleton and you can get a peek at Sue before it’s unveiled soon. It’s out of the way, and we would’ve missed it had we not gone on the tour. When we visited The Field Museum in 2018, SUE the T.rex was in her new home upstairs, but the home itself wasn’t finished. At press time of this post, SUE’s new home is finished and open to the public. 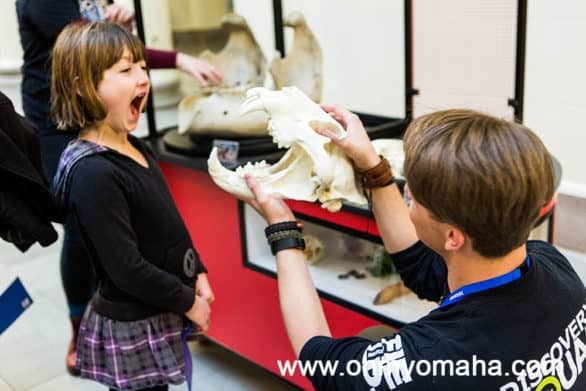 The museum’s general admission gets you into a ton of exhibits that will appeal to kids, from mummies to extinct animals to anthropological exhibits of cultures around the world. In my limited experience, it’s not really worth it to buy tickets to the temporary exhibits (unless it’s a topic you really love). We bought tickets to one, and it was $50 for our family to see that one added exhibit. And, my kids just rushed through it, anyway. Dining tip: There are two year-round restaurants at the museum, as well as a seasonal outdoor restaurants. We ended up walking to Giordano’s for some deep dish Chicago pizza, instead of trying one of the restaurants. The Art Institute of Chicago is often rated the best art museum in the world. It’s huge, it’s full of incredible works of art, hundreds of thousands of pieces you can’t possibly see in one visit, and definitely not if you’re visiting with kids. The best tip? Do the JourneyMaker experience with your kids. 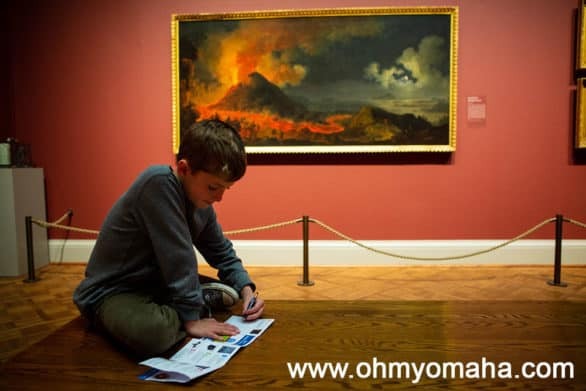 This free, customized itinerary maker for kids lets them pick a theme, then select artwork to include on the itinerary, and then they have to hunt for the art in the museum and complete small activities. Once they’re done, they get to choose a free art postcard. My daughter used the JourneyMaker computer to create a customized itinerary for exploring the Art Institute of Chicago based on what interested her. You’ll find the JourneyMaker computers in the Ryan Learning Center. 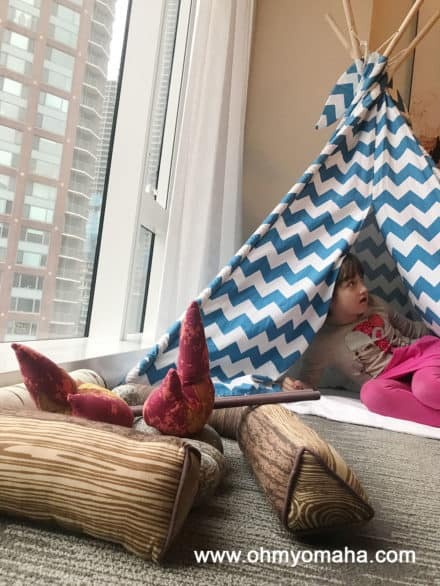 You should probably plan on spending some time in the rooms of the learning center, as there are art-making activities, toys, and books there for kids. The JourneyMaker at Art Institute of Chicago lets kids create their own themed tour of the museum that includes activities for each stop and a prize to collect at the end. Anyway, the massiveness of the art museum was almost going to be too much, but the JourneyMaker itinerary took us through many galleries, so I did get to see quite a bit. However, my daughter was so set on finishing it, we ended up breezing through some of my all-time favorite works of art, which was a little heartbreaking. A lot of people told us to take the kids to the Thorne Miniatures Room, that they’d love the pretty scenes in the tiny rooms. Maybe your kids will. My daughter was mildly interested, but still just dead set on finishing the JourneyMaker so she didn’t want to look for long. 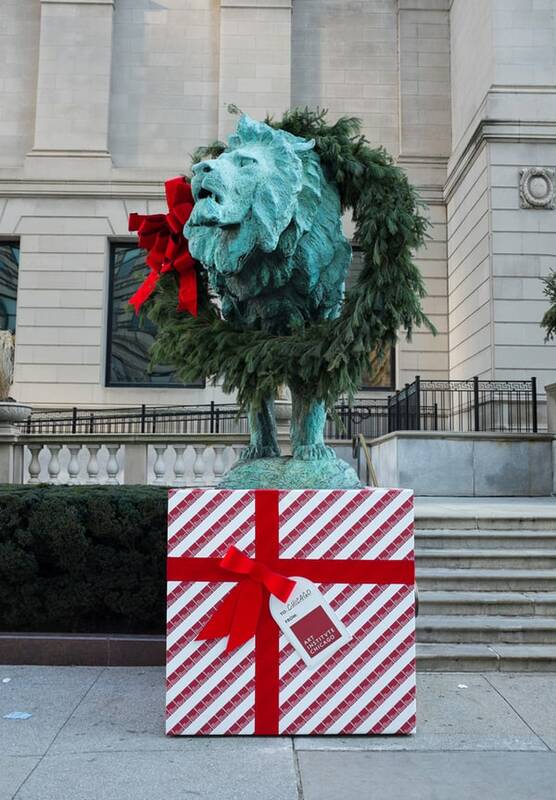 The lions in front of the Art Institute of Chicago are each adorned with a large wreath during the holiday season. When we did the JourneyMaker activity at the museum, my daughter chose the lions as one of our stops. It took us about 2 hours to do the JourneyMaker itinerary, with stops to linger in the Impressionist gallery and a (very) brief stop to see the miniatures. We didn’t have any sweet reciprocal discount, but the good news is that kids are admitted free. Dining tip: There are three cafes in the museum. What’s nearby: We paired a visit to Maggie Daley Park with a visit to the Art Institute of Chicago. They’re within walking distance of each other. 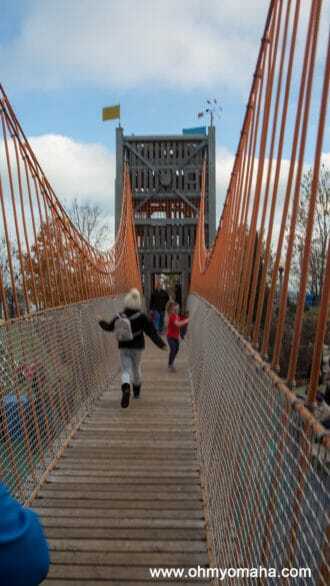 This park will spoil you for all other parks – it’s that amazing and fantastically designed. 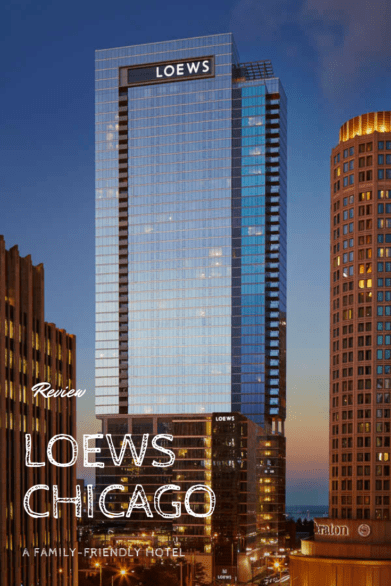 Loews Hotels has two Chicago locations. I wrote about the downtown Chicago location recently and how it’s conveniently located to some of our favorite things in the city. The other hotel’s location is near O’Hare International Airport in Rosemont, Ill. We stayed there for a night during our Chicago holiday getaway with the kids. 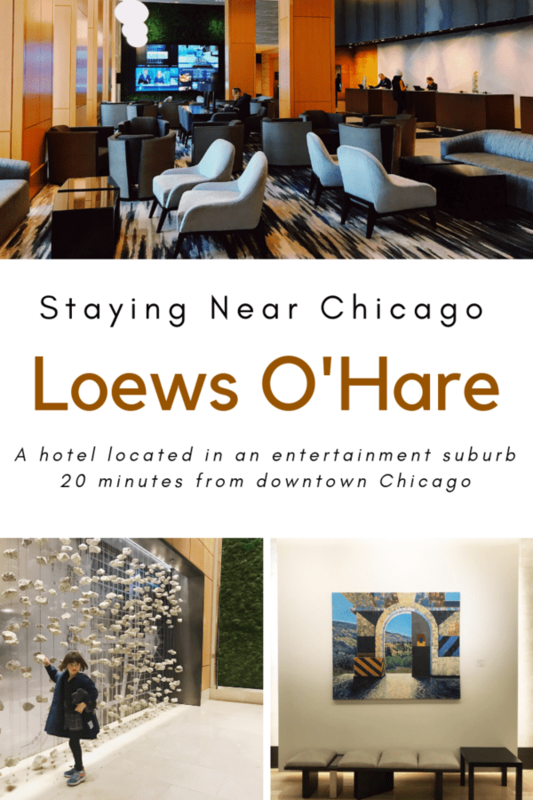 Here’s what a stay at Loews Chicago O’Hare is like. Disclosure: Our stay was hosted by Loews Hotels. All thoughts, opinions and typos are my own. This post may contain affiliate links. At no additional cost to you, if you make a purchase after clicking a link, I may receive a small payment for referring you. If you haven’t heard of Rosemont, Ill., it’s a community about 20 minutes from downtown Chicago, with easy access to the city thanks to the train. It’s also about 5 minutes from O’Hare Airport. 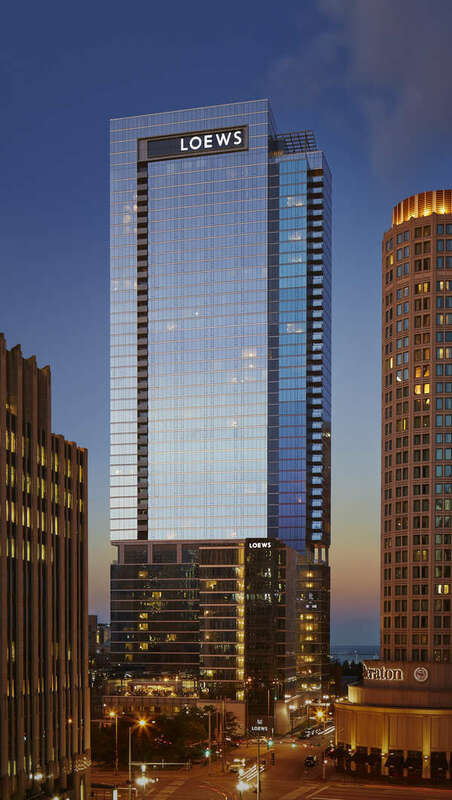 Loews is an upscale, welcoming hotel, though, I’ll be up-front for your traveling with kids – there is no pool. 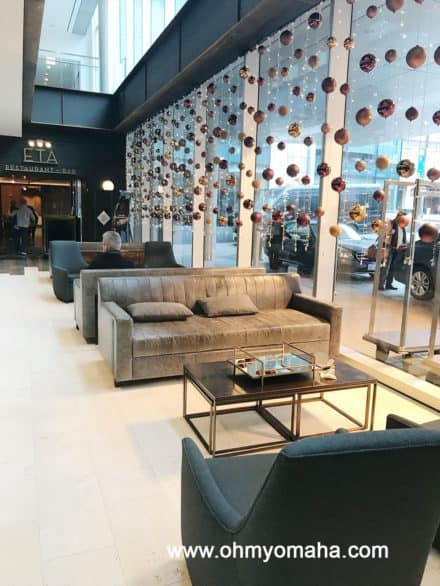 This gorgeous hotel seems to be better suited for travelers flying in and out of O’Hare and business men and women. Still, it’s a lovely place to stay overnight. The lobby at Loews Chicago O’Hare was immense and had some neat artistic touches. This particular location has a lot of artwork, from the moment you walk in, even. Floors have their own gallery even. I spied this cool artwork above a unique bench just walking around the ground floor. The lobby was chic and I loved the greenery on the walls. 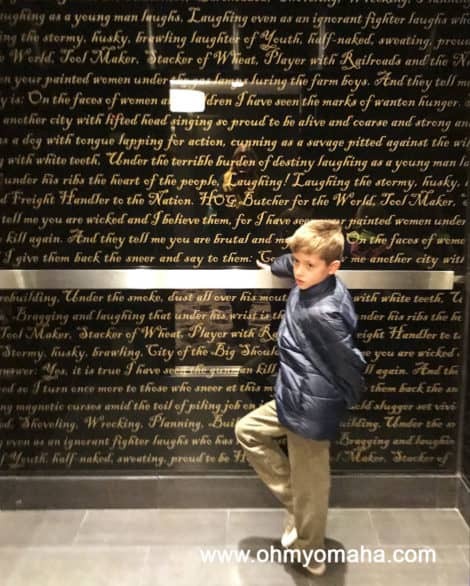 This interesting wall is in the entryway of Loews Chicago O’Hare. Those are large rocks hanging from strings. To the right is a wall of green, grass-type stuff. The service, as was the case in the downtown location, was impeccable. 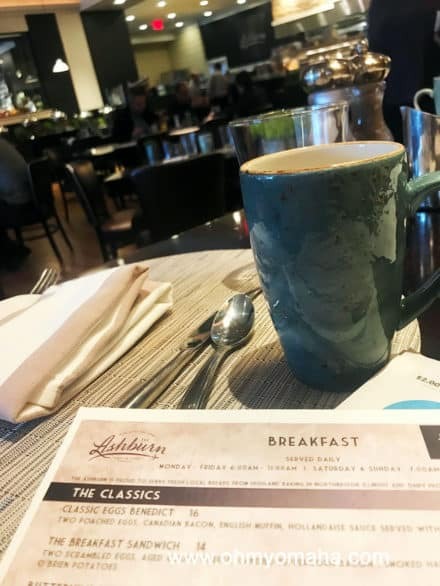 We had breakfast at The Ashburn, the restaurant with an aviation theme inside the hotel, and when we left, they remembered our names to ask how our meal was. I liked the touch of color at The Ashburn, like this blue coffee mug I got at breakfast. A word about the restaurant, The Ashburn. We went with the kids to breakfast there, as guests of the hotel. The Ashburn had a kid’s menu, with typical fare like fluffy pancakes, french toast, and eggs. My breakfast at Loews O’Hare’s restaurant, The Ashburn. Fresh vegetables, a crisp bagel and lox. For me, it was a tough call between ordering the buffet or something off the breakfast menu. The buffet had fresh fruits, pastries, quite a few hot dishes, and house-smoked salmon. After a weekend of heavy foods, I decided to get a light breakfast and ordered the salmon. It was a good call. My breakfast was just the right amount of food and tasted great. We stayed in a room with two queen beds and a lounger. The view wasn’t much, but it was also snowing so there wasn’t much visibility anyway. The beds in our room at Loews Chicago O’Hare. The size of the room and bathroom was comfortable for a family of four with minimal luggage. There was plenty of closet space, if you needed it. We ordered room service and ran out of places to sit, besides the bed. One of the coolest things a hotel brand can do is to localize the experience when staying at a property. If you’re staying at Loews Chicago O’Hare, you’ll find they’ve made quite an effort to introduce locally-made products in food and drinks. Flavor by Loews Hotels is a brilliant way to introduce travelers to local products. 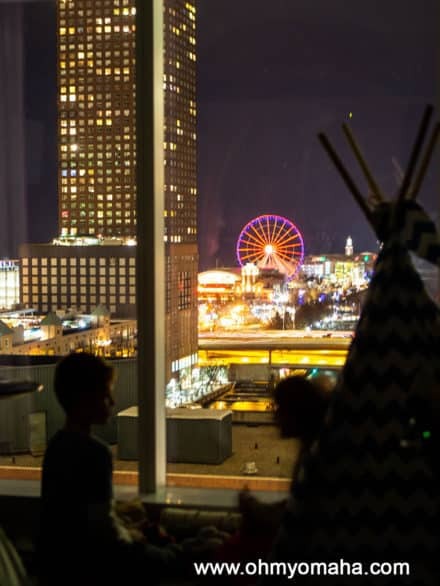 Flavor by Loews Hotels is built on partnerships with artisan food & beverage vendors, and its starting to roll out in Loews destinations across the nation. 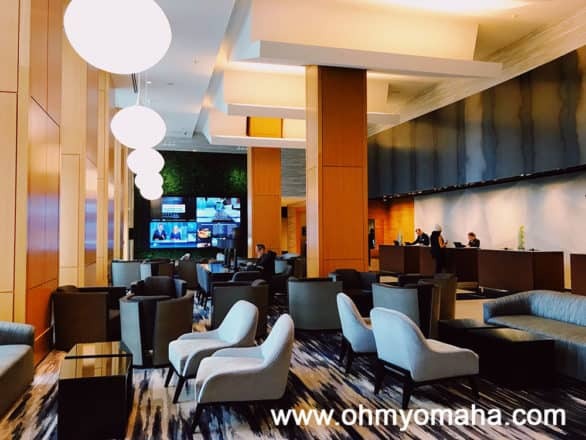 At the Chicago O’Hare Loews, Flavor by Loews Hotels has different brands to try. 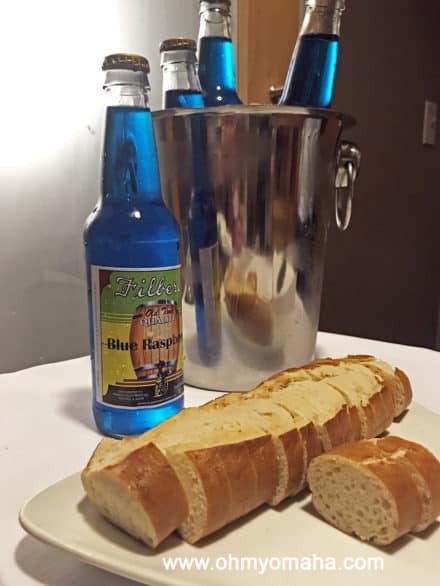 Filbert’s Old Time Root Beer is available at The Ashburn; Veruca Chocolates boutique chocolates are paired in desserts at The Ashburn and in-room service; and Rare Bird Preserves are served at breakfast and desserts as well as in sauces used in dishes on the menu at The Ashburn and in-room dining. We found even more products at the Loews Downtown Chicago location. I you’re there, try Chicago Honey Co-op honey in a cocktail at Streeterville Social; cold-pressed juices are available in ETA Restaurant + Bar; and Revolution Brewing’s Zephyr beer is exclusively available at Loews Chicago Hotel in ETA Restaurant + Bar, The Lobby Lounge and Streeterville Social. 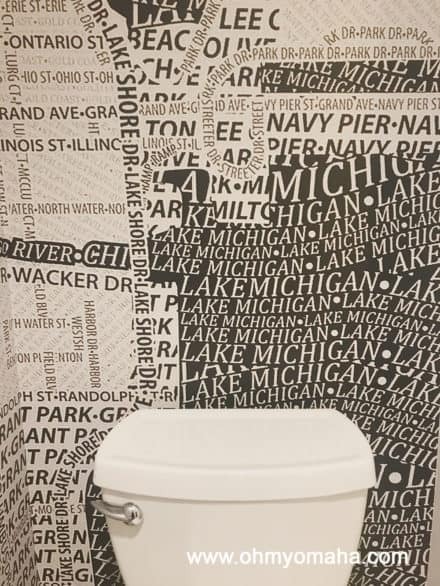 I suspect that many of the guests staying at the hotel were staying there for one particular reason: It’s very near Fashion Outlets of Chicago. I saw a lot of people passing through the lobby carrying shopping bags from brands like Armani, Guess and Neiman Marcus. 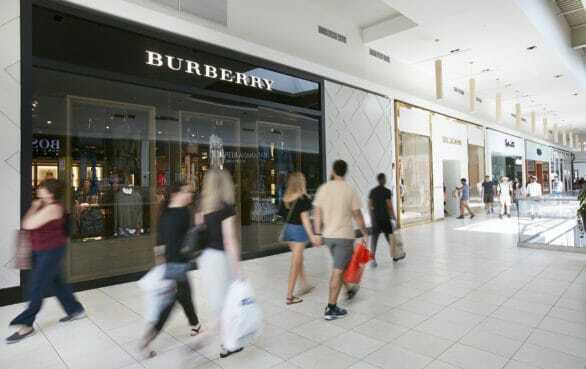 It’s a huge mall – a 530,000 square-foot, two-level indoor shopping center with more than 130 designer outlets like Gucci and Prada. Anchor stores include Bloomingdale’s The Outlet Store and Saks Fifth Avenue OFF 5TH. My kids? They liked the Disney Outlet store, in particular. We went to the mall during the holiday season to meet Santa and tour Santa HQ by HGTV. It’s a high-tech Santa experience, complete with an Elf Academy. If you go, know that it’s open through most of November and closes on Christmas Eve each year. The view of Santa HQ from the second floor of the Fashion Outlets of Chicago. The seasonal experience is at the mall every November and December. Doing Santa HQ is about the same price as going to see a regular Santa at the mall, which is to say, not cheap, but when you add in the extras, it’s worth it. Plus, having the ability to make a reservation beats standing in line and waiting. Loews Chicago O’Hare is also near Parkway Bank Park, a massive entertainment district with up-scale restaurants, bowling, and in the winter, outdoor ice skating. We were in Rosemont during a snow storm and had the hardest time figuring out the parking situation at Parkway. We were trying to have dinner at Hofbräuhaus Chicago, but could not find parking. It was frustrating, and ultimately, we ended up just driving back to the hotel. Tip: It turns out, our mistake was trying to park in front of the restaurant — there’s very little surface parking, so you just have to park in the nearby, massive parking garage. 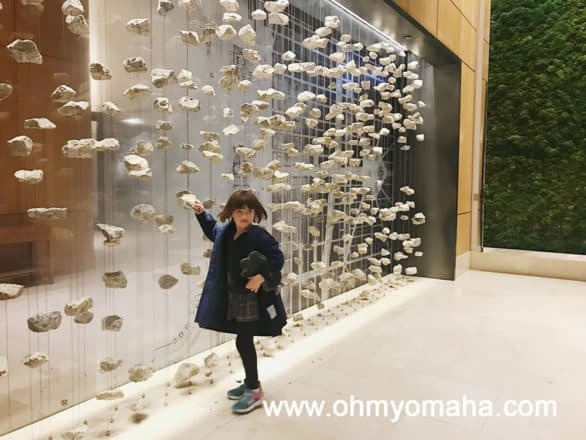 If we had more time, there was plenty more for our family to explore, including bowling at Kings Dining & Entertainment, indoor sky diving at iFly, and the free interactive museum, Big Ten Experience. 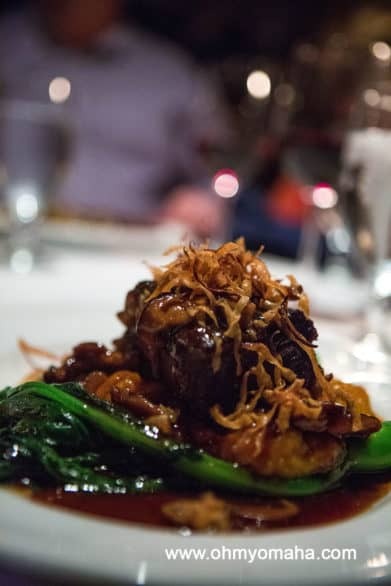 Dinner at the Tortoise Supper Club was, hands down, the most memorable meal for us. Think: White table cloth, attentive servers, and if you’re there late enough on the right night, live jazz music. It doesn’t sound like it’s a place to bring kids to, but it was. Our waiter, Sergio, was particularly kind to the kids. As guests of the restaurant, we had quite the experience. However, it’s important to note that there is no kid’s menu here (so no lower prices for smaller appetites). Your kids would have to order from the regular menu. One of our kids ordered a cheeseburger, the other went for steak. 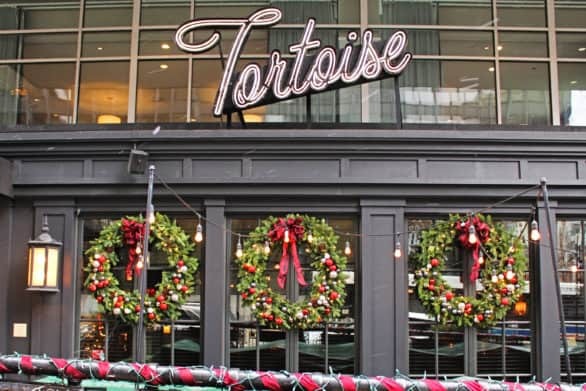 We had dinner at the Tortoise Supper Club in downtown Chicago. I tried the French onion soup, which was delicious and the kids liked, too. My entree was a special, the short ribs. We were there on Saturday night, which is prime rib night. The spare ribs at the Tortoise Supper Club. Dessert was so good. We tried the chocolate tortoise (because, you know, it’s the Tortoise Supper Club) and key lime pie. No kidding, key lime pie is the thing to get. The Tortoise Supper Club is within walking distance of the hotel we were staying at, Loews Chicago. I’d read about Macy’s Walnut Room in Chicago, how it was a grand restaurant inside a department store. When it first opened in Marshall Field, it was the first of its kind. And I’d read about it being decked out for the holidays, so I decided we’d brave the crowds for diner on Black Friday. The Walnut Room is a restaurant in Chicago that is truly decked out for Christmas. This was our table’s view of the tree. Apparently, everyone was done shopping for the day by the time we went, because we had a very short wait. The dining room was impressive, with a large Christmas tree stealing the show. People stopped by the restaurant just to get pictures in front of it. You could get the buffet or order off the menu, and since I’d wanted the famous chicken pot pie, I skipped the buffet and ordered that instead. It was a good idea. The restaurant also had a kid’s menu. The kids got pictures taken with each of the princess who stopped by our table at the Walnut Room. The princesses granted wishes and gave the kids a small gift (magic stones, according to my daughter). While we waited for dinner, fairy princesses wandered the dining room, granting wishes to children. It was totally unexpected, so I don’t even know if this is a regular thing or just on the weekends or what. But, it really added to the experience, especially for my daughter. I’ve asked friends in Chicago and the Twitterverse for suggestions on where to get good Chicago pizza. The consensus was that no one could agree. So, we ended up going to the place I hadn’t been to before: Giordano’s. There are several locations in the city, and we ended up at one not too far from The Field Museum. 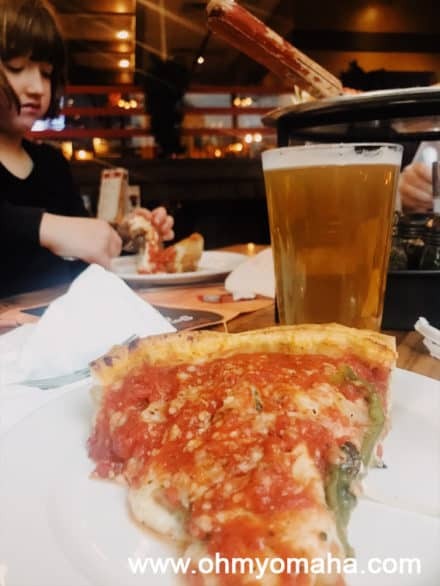 A slice of Giordano’s deep dish pizza and a pint of Goose Island’s 312 Urban Wheat Ale. When in Chicago, right? It was pretty good, but I’ll be honest, Chicago-style pizza just isn’t my kind of pizza. It’s a lot of crust for me. My kids weren’t enthused about it as I had expected, either. I’ve also had Gino’s East on previous visits, and the décor there makes it worth a visit in my book. I love breakfast and enjoyed three great breakfasts during our visit. We tried Do-Rite Donuts one morning. This tiny shop always had a little line, and it’s easy to see why. The huge donuts are fresh and delicious. In order to try a few flavors, we split three. The birthday cake and red velvet coconut were my favorites. We went to Do-Rite Donuts for the freshly-made donuts and tasty chicken sandwiches. We also ordered chicken sandwiches, just to have a little something to keep us satiated. If you’re from Omaha, I’d say the donuts were better than Bob’s Donuts, but I can’t say the same for the chicken sandwiches. 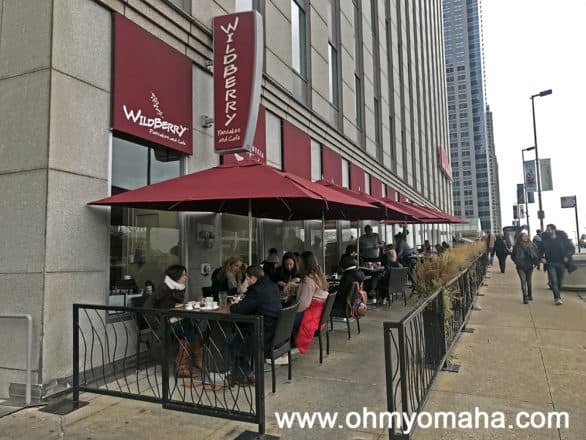 Another memorable breakfast that was within walking distance of the Loews Chicago in the downtown area was Wildberry. We went to the Wildberry near Millennium Park. The wait to eat at the restaurant on a Saturday morning was, indeed, wild. We opted for outdoor seating and only had to wait 30 minutes. Wildberry is near Millennium Park, and a very popular place for breakfast. So popular, people are fine eating breakfast outside in November. Yes. Outdoors in November. It worked, though. The food was really good and filling. The coffee was also exceptional. There is a kid’s menu, too. Items for kids included silver dollar pancakes for $4 or specialty pancakes for $5 (including fresh berry pancakes, Fruity Pebble pancakes, and Oreo s’more pancakes), one egg meal for $5, and a few lunch offerings. Juice or soda are included with that price. Being near Millennium Park, be sure to walk over to see “Cloud Gate,” AKA The Bean. We let the kids explore Maggie Daley Park for about an hour after a sugary breakfast. This was just one of the playgrounds there. And, if the kids are really loaded up on sugar from pancakes at Wildberry, walk a little further to Maggie Daley Park. It might be the most incredible park you’ll ever visit. It’s huge, and it should wear your kids down. Our other breakfast was in Rosemont, Ill., at The Ashburn. The Ashburn is located inside Loews Chicago O’Hare Hotel, and we were guests of the hotel there. For breakfast, you can order off the menu or get the buffet. The buffet had a lot of options, many of them healthy, but we opted to order of the menu. I had house-smoked salmon, which was light and really good. Coffee was also delicious. 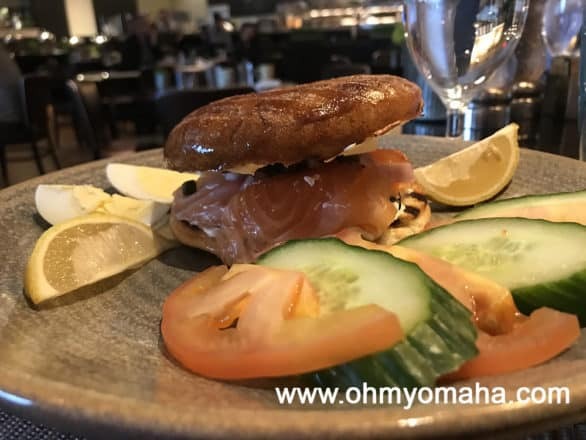 After having breakfasts of donuts and pancakes at other restaurants, the house-smoked salmon at Ashbury was a welcome sight. It was a light breakfast. The Ashburn had a kid’s menu, and the fluffy buttermilk chocolate chip pancakes were pretty filling for the kids. I sampled them and they get my approval. Breakfast prices on the kid’s menu ranged from $4 for a fresh fruit bowl or oatmeal, to $7 for bacon and eggs, waffles, pancakes or french toast. 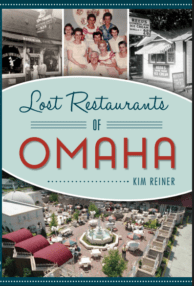 One thing to note about Loews Hotels like the one this restaurant is located in: They source a lot of food and drinks from local businesses. It’s a program called Flavor by Loews. Disclosure: This post contains affiliate links. At no additional cost to you, if you click the link and/or make a purchase, I may receive a small payment for referring you. There were three places we had planned on seeing Christmas trees. 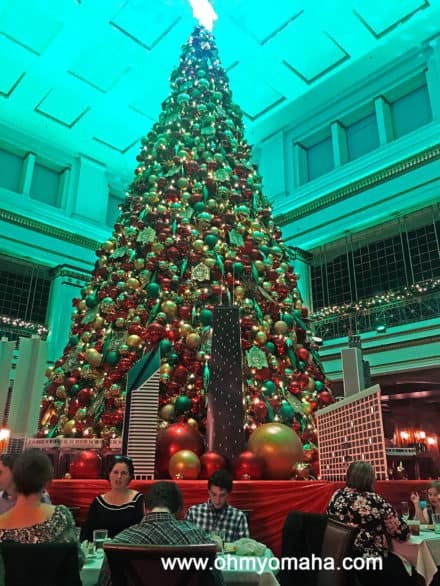 For a meal under a giant Christmas tree, you’ve got to head to Macy’s Walnut Room. Many people go just to take a picture. We went on a Friday night and expected a terribly long wait (it was Black Friday), but got in pretty quickly. 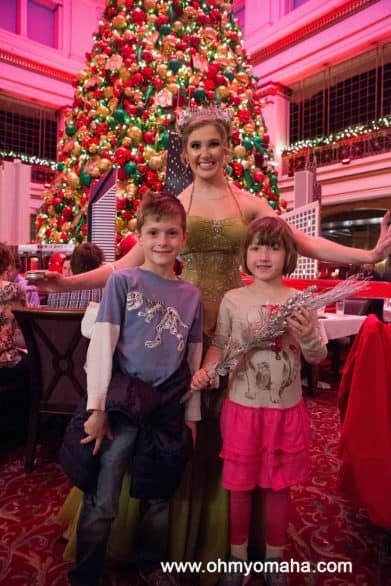 The kids posing with a fairy princess at the Walnut Room inside Macy’s department store in downtown Chicago. Fairy princesses strolled the room during the meal, granting wishes and handing out wishing stones. It was an unexpected experience that my daughter particularly loved. The service, by the way, was fantastic. 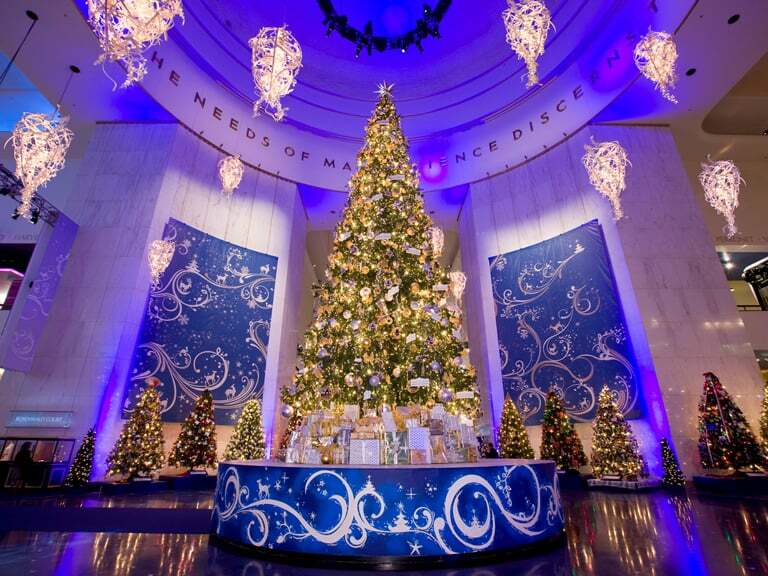 Tip: You cannot make a reservation for The Walnut Room during the holidays. We did not have much of a wait, but plan accordingly. They will not seat your party unless everyone is there. 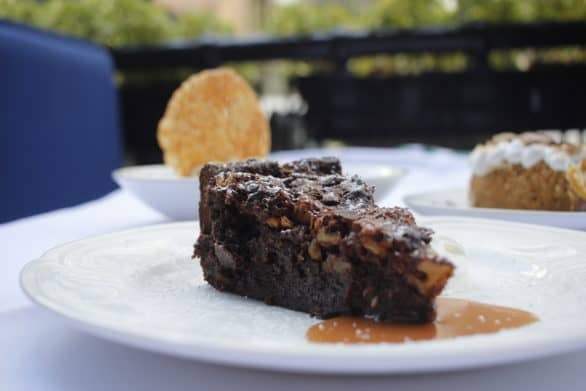 And what should you try at the Walnut Room? Get the famous chicken pot pie. To see trees with an around the world theme, head to the Museum of Science & Industry. Their Christmas Around The World and Holiday of Lights display is full of impressive details. I liked looking at festive trees, but my kids were not interested (due to the fact that the rest of the museum was so stinking amazing). On the weekends, there are performances I wish we could’ve seen. There’s also a gorgeous, giant tree that’s the centerpiece of it all. On the hour and half-hour is a “snowfall.” We hung around to see it once. It’s not too exciting, at least not for a 7-year-old. 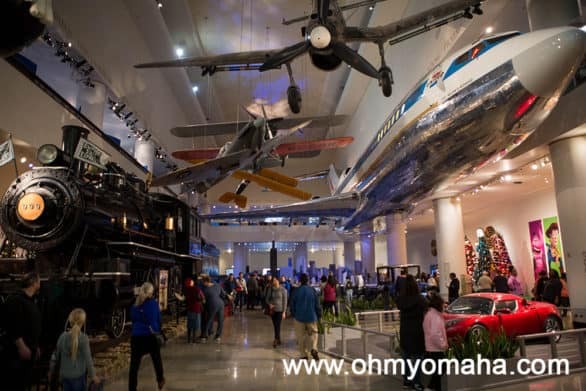 Tip: If you have a membership to Omaha Children’s Museum, you get reciprocal free admission to the Museum of Science & Industry. This is a HUGE savings. The extra exhibitions and experiences are a considerable add-on. We did the coal mining experience and it was OK (not totally sure it was “$40 OK,” though). The extra I do think was worth it was the $5 toy building assembly line. The tops the kids made work great. The machine did have a few moments of not working, so it wasn’t a smooth process, but still, I’d recommend it. On Friday nights during the holiday season, you might catch live holiday music being performed in front of the iconic “Bean” sculpture at Millennium Park. 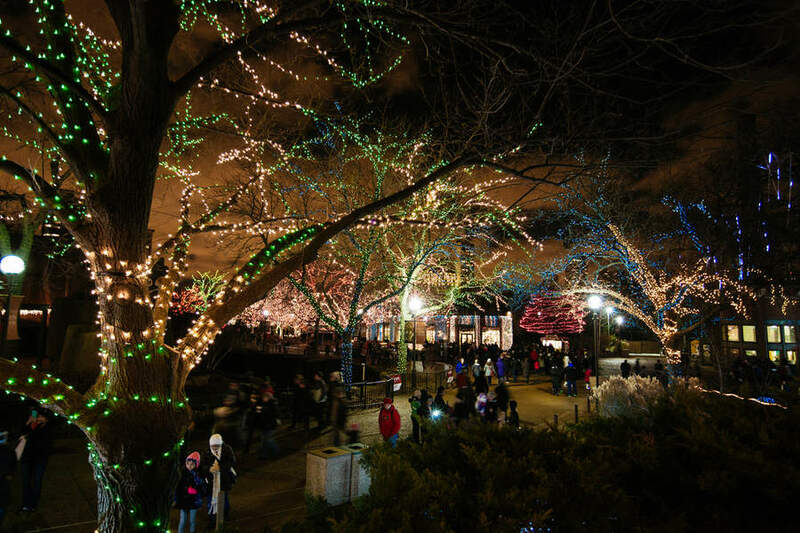 For the ultimate Christmas tree experience, head to Millennium Park. There’s ice skating with the giant Christmas tree lit up in the background. We visited on a Friday night and they had live Christmas music by “Cloud Gate,” AKA, The Bean. Everyone in the crowd sang along. These concerts happen every Friday from 6 to 7 p.m. during the holiday season. Christmas trees on Wabash Avenue in downtown Chicago. Chicago is a great city to see holiday lights. We happened upon gorgeous displays on walks from our hotel, Loews Chicago. Two great trees can be found on Wabash Avenue by the river, right by the Ghirardelli store. 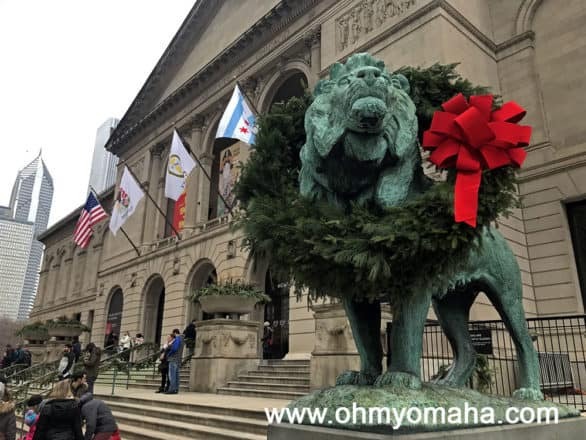 Museums were definitely on our itinerary, and the ones we visited had their own Christmas decorations to enjoy. I already mentioned Museum of Science & Industry, and that was, by far, the most decorated place of the three we went to. 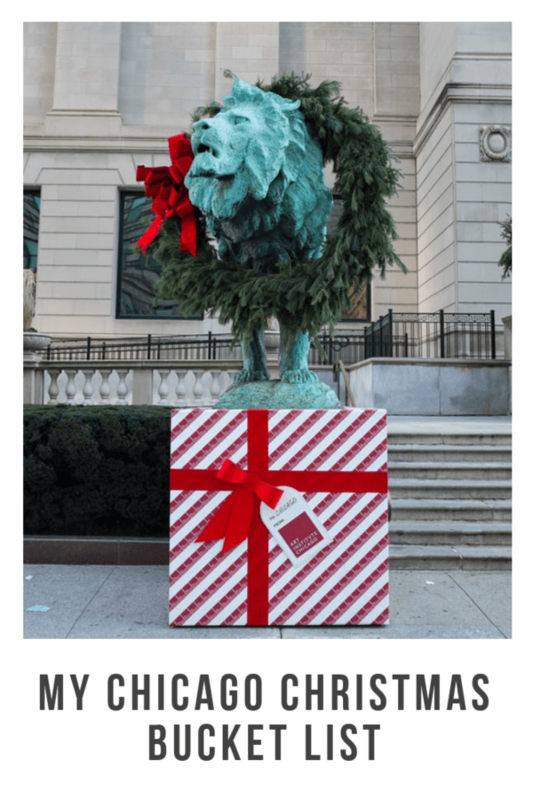 The Field Museum has decorations up during the holiday season. The Field Museum had holiday lights set up in the main lobby and on stairwells, plus some wreaths hung up. It was minimal but done really well. 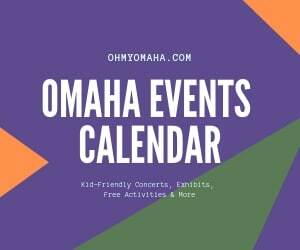 Tip: If you have a membership to Omaha Children’s Museum,you get reciprocal free admission to the Field Museum. This is a HUGE savings. The extra exhibitions at The Field Museum are a considerable add-on. Admittedly, the one we chose was not worth it. Tip: If you take little ones to Art Institute of Chicago, you’ve got to stop first at the Ryan Learning Center in the Contemporary Building. 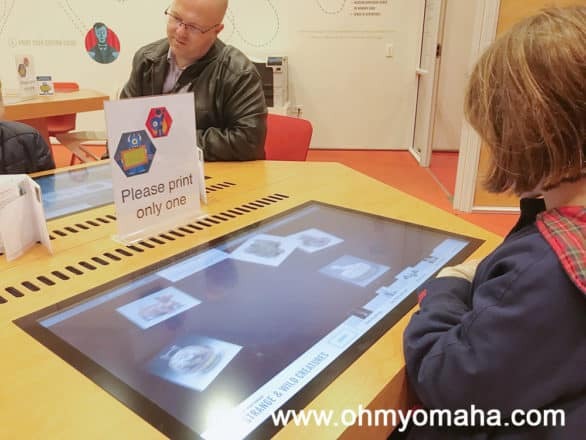 There, in addition to some great art activities, you’ll find the JourneyMaker center, where kids can create a mini tour of the museum based on a theme they choose and the artwork they choose to see within that theme. The kids loved it, and it made an extremely large museum manageable for a child. 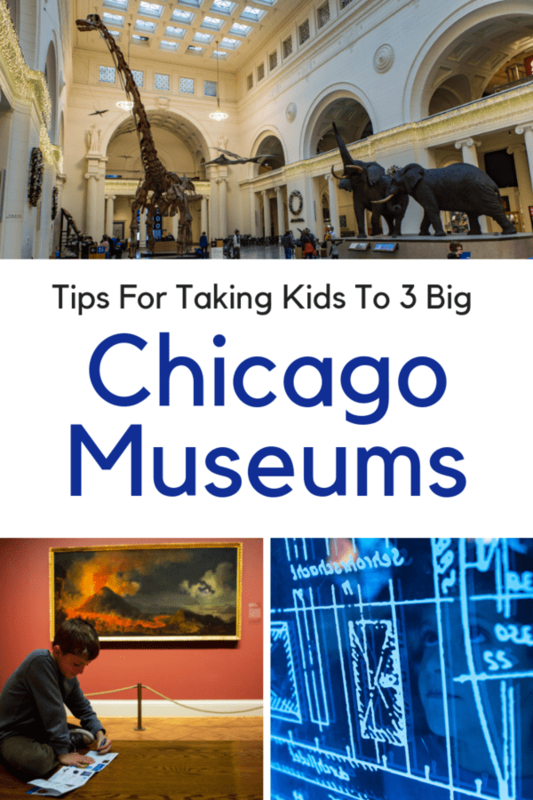 We had four stops on the tour – both kids chose creatures theme – and it took us to quite a few galleries, including my favorite, the Impressionists area. In about an hour, we had found the art, did the little activities associated with each stop and made it back to the learning center to collect their prize (a postcard of their choice). The JourneyMaker at Art Institute of Chicago let’s kids create their own themed tour of the museum that includes activities for each stop and a prize to collect at the end. Most Chicago restaurants we visited had some sort of decoration, but one stood out for the decor and another stood out for the food. 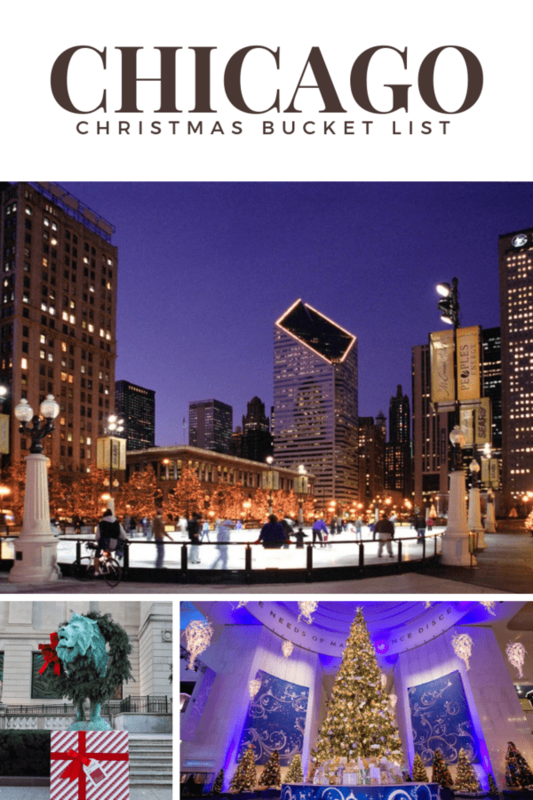 The Walnut Room is a restaurant in Chicago that is truly decked out for Christmas. I already mentioned the Walnut Room at Macy’s. The giant Christmas tree is a show-stopper, for sure, but the food is very good too. And, it’s kid-friendly with a menu for the little ones. 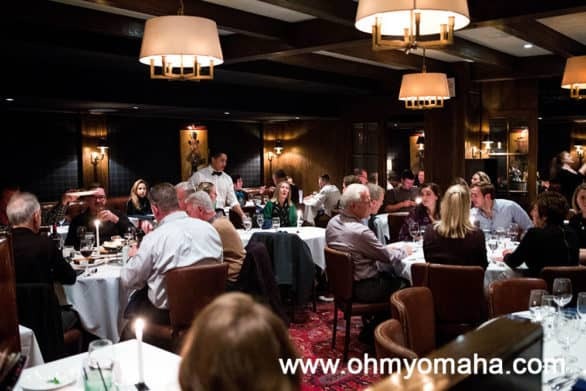 Another downtown restaurant we enjoyed was the family-owned Tortoise Supper Club. Disclosure: We were guests of the restaurant on our visit. While there was some classy holiday decor, the memorable thing for us was the food during our visit. 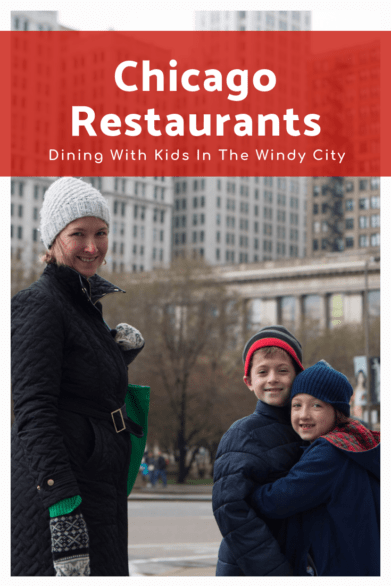 It’s not as kid-friendly, in the sense that there is no kid’s menu or kid portions, but the staff warmly welcomed my kids and the other families in the restaurant. I’ll write more about it soon, but if you do find yourself there, my tip to you is to get the dessert (key lime pie or tortoise pie). Time did not allow for us to fit in a trip to an outdoor iceskating rink in Chicago, though there are two that were within walking distance of our hotel, Loews Chicago. 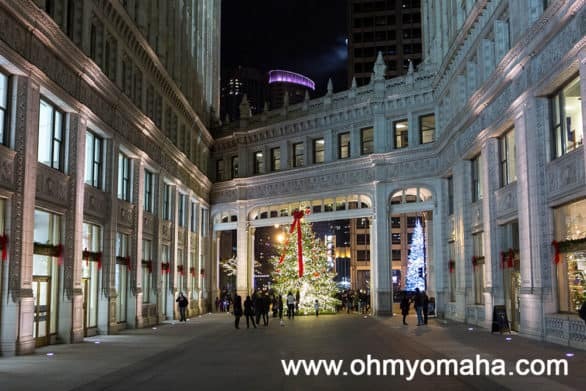 The one at Millennium Park is traditional oval shaped with a very charming Christmas tree in the background. The walk from Millennium Park to Maggie Daley Park in Chicago was easy thanks to this cool bridge. The other is at Maggie Daley Park, which is just a bridge walk from Millennium Park. It’s an ice skating ribbon, which looks a little more fun than just going in loops. We skipped the ice skating, though, and went straight to the amazing playground at Maggie Daley Park. I think we made the right call on a particularly mild winter day. 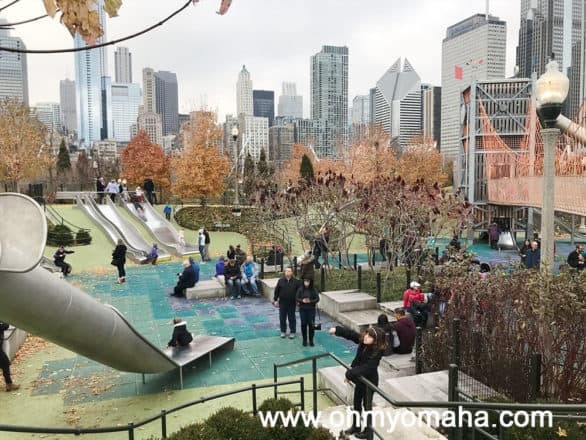 Maggie Daley Park in downtown Chicago has a massive playground as well as an outdoor ice skating ribbon in the winter. 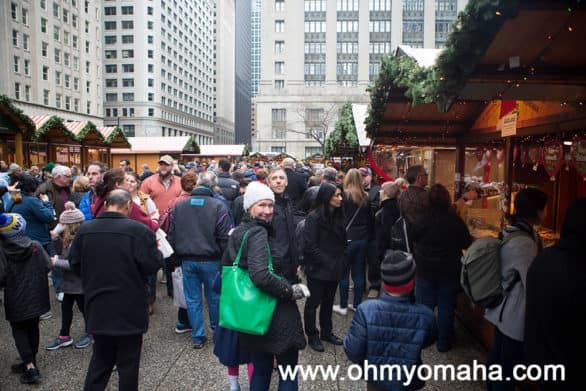 The Christkindlmarket was on my wish list to visit for years. 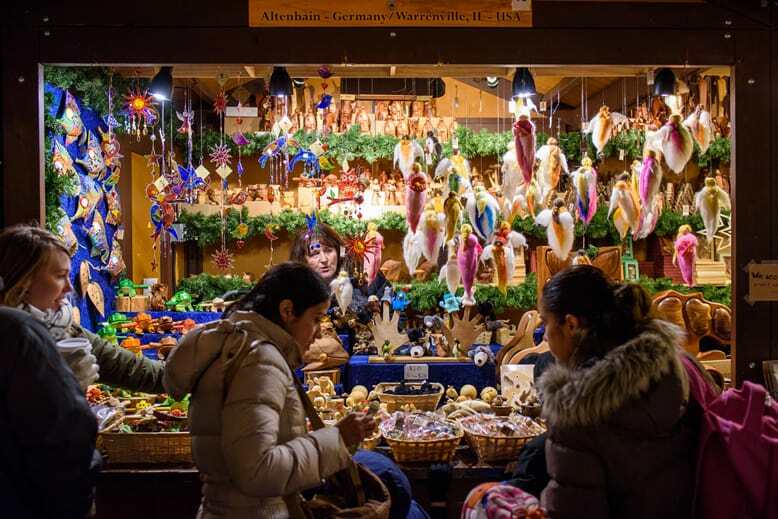 Modeled after German Christmas markets, it’s an outdoor market with vendors selling gifts, food, and drinks. All smiles before the immensity of the crowd at Christkindlmarket really sunk in. It’s very charming, in theory, but the crowds are overwhelming. I was warned by many to go early, and man, did I try to get there first thing one morning. We ended up arriving about 30 minutes after it opened, and it was packed. One particular aisle was crammed, and we shuffled our way barely seeing the booths. My kids still enjoyed it, and found souvenirs for themselves and a gift for one aunt. 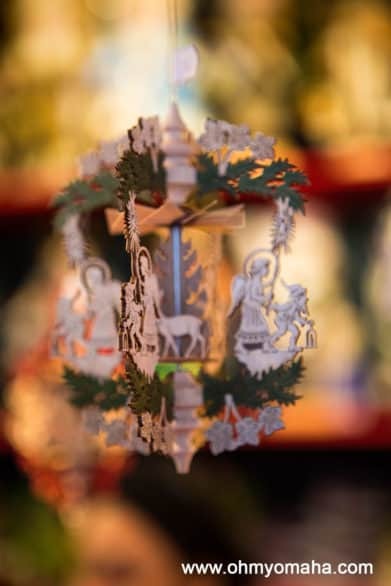 An ornament found at the Christkindlmarket in downtown Chicago. I did, at least, have some tasty pastries and gluhwein, so it wasn’t a total wash.
Christmas is everywhere in stores, and Chicago retailers do it up well. Downtown, you’ll want to check out Macy’s window displays of exquisite scenes. Shoppers on Black Friday in downtown Chicago. 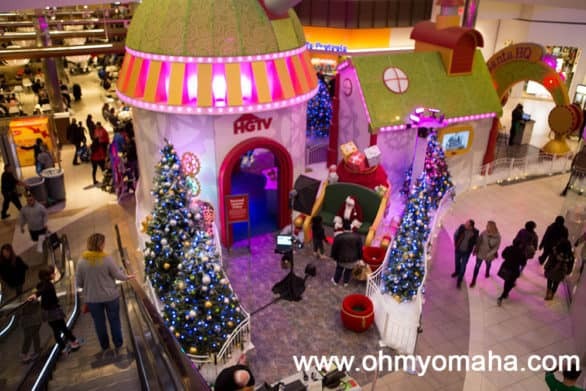 A train ride away, or in our case, a car ride, is the Fashion Outlets of Chicago in Rosemont, Ill. We were guests of the mall and got to try out a pretty high tech Santa experience called Santa HQ, presented by HGTV. The cost is comparable to photos with Santa at other malls, but this is an immersive experience that goes beyond the typical wait-in-line-for-a-photo Santa experience. The entrance to Santa HQ at the Fashion Outlets of Chicago. 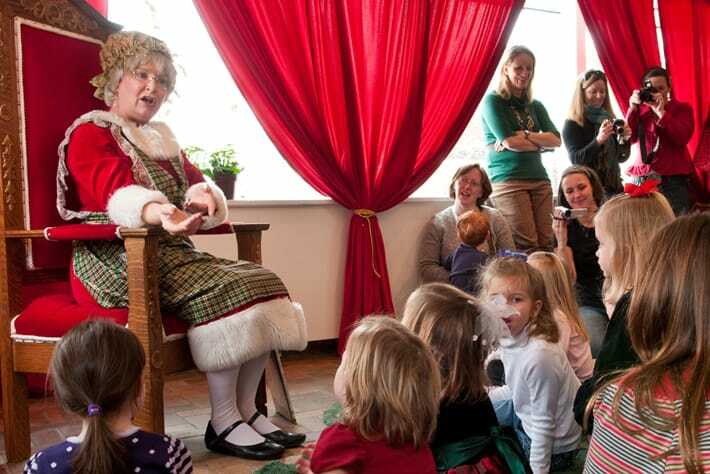 It’s an immersive experience that ends with kids meeting Santa Claus. 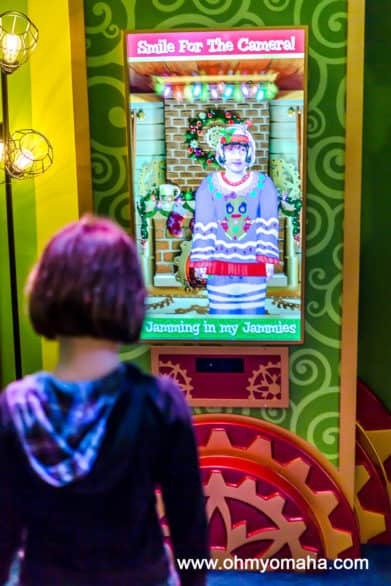 The kids were able to go through the Elf Academy, and make digital elf versions of themselves, step on a Naughty Or Nice detector, and use an iPad to see virtual elves around Santa HQ. Pretty nifty stuff. My daughter trying out some of the techy fun at Santa HQ at the Fashion Outlets of Chicago. 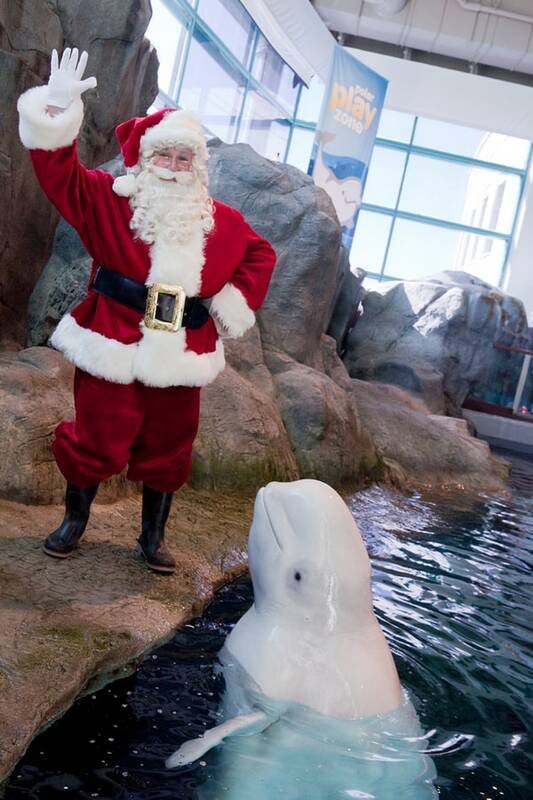 It ends with photos with Santa, and sharing wish lists with him, plus the kids receive goodie bags. 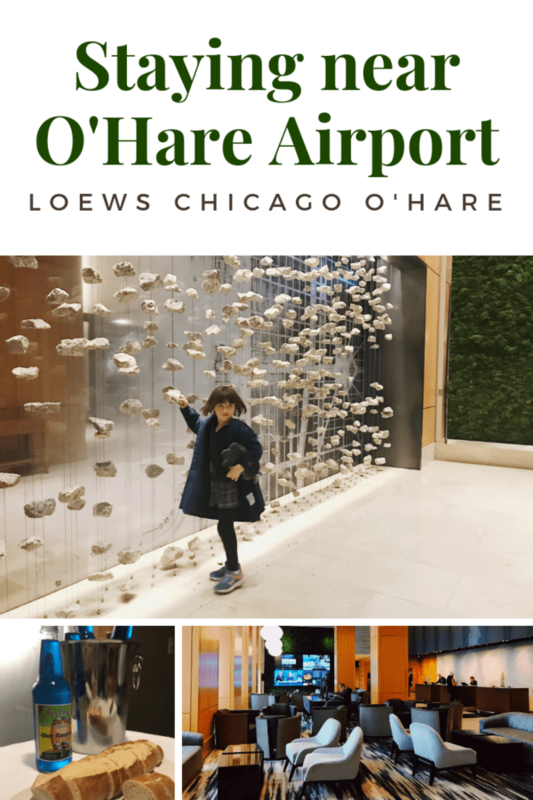 I partnered with Loews Hotels for this trip and found the downtown Chicago location to be absolutely ideal for my family’s trip. 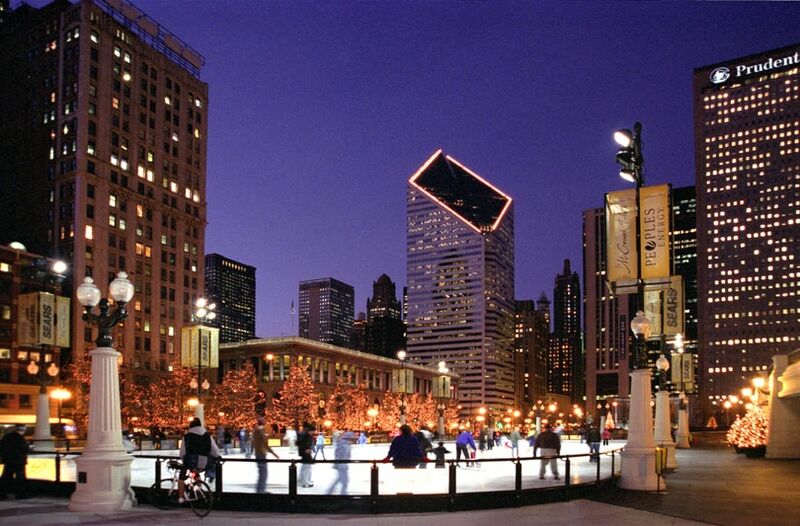 Many of our destinations, like Millennium Park, are within walking distance. Our hotel for most of the Chicago trip, Loews Chicago, was located in downtown Chicago. 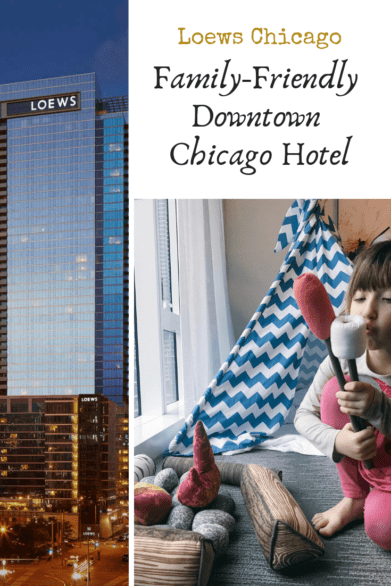 In the winter, Loews Chicago offers the Snowed Inn package for families, which includes cookies & hot cocoa, a rented movie, and valet parking. Nice right? They also set up a cute tent and campfire set for the kids to play with. 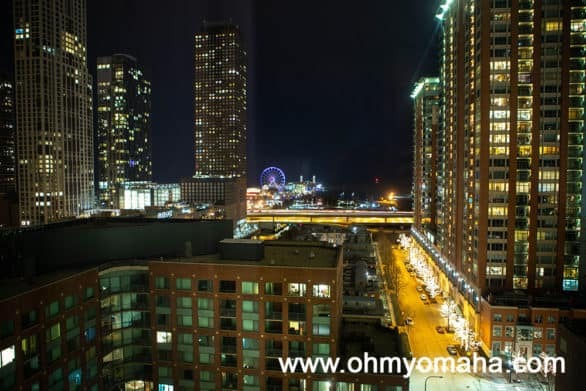 We could see Navy Pier from our window on the 14th floor of Loews Chicago. Can’t beat the view, either! 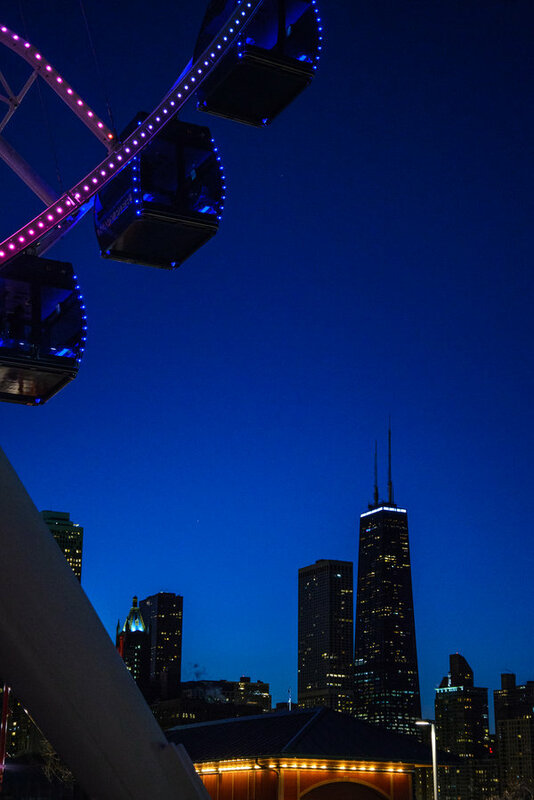 That’s Navy Pier in the distance, with the big ferris wheel lighting up the background. 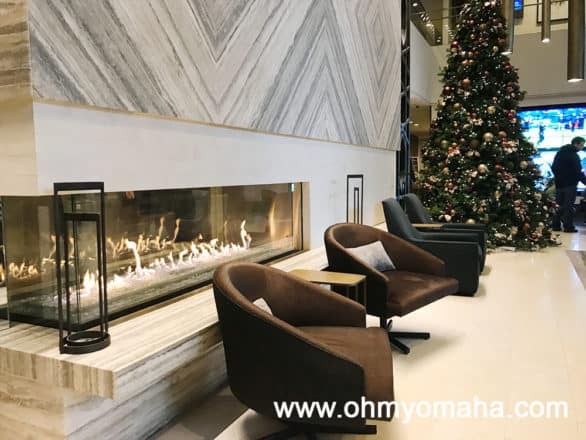 If you think Santa HQ is another destination for you, there’s a Loews Hotel location (O’Hare) that’s super close. If the weather hadn’t been crummy, we could’ve walked to it. The lobby at Loews O’Hare was large and set up for gathering. There were neat artistic touches throughout the hotel. Check back in a few weeks for reviews about our stay at each hotel! I’ll tell you about the rooms and the family-friendly amenities at each. 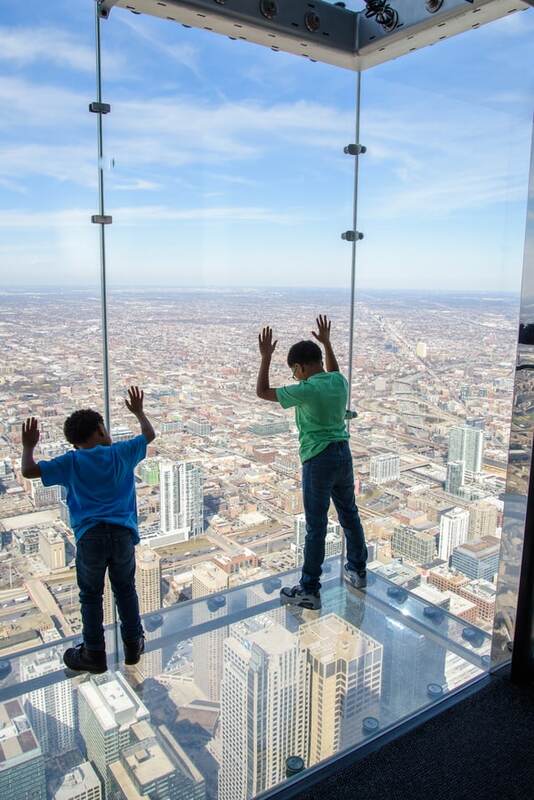 Want to visit Chicago with your family? Here are a few additional posts to help plan things. 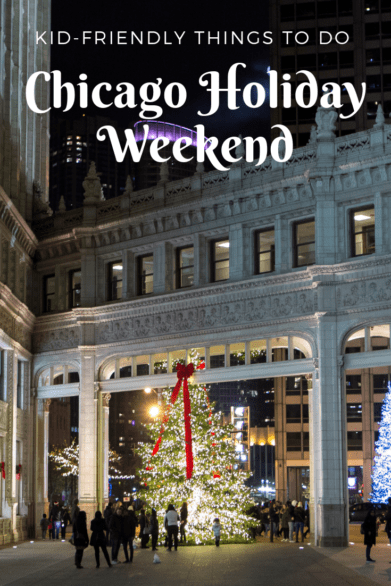 Start with my Chicago Holidays Bucket List – there’s quite a bit on the post that isn’t just for Christmas time in the city, too! 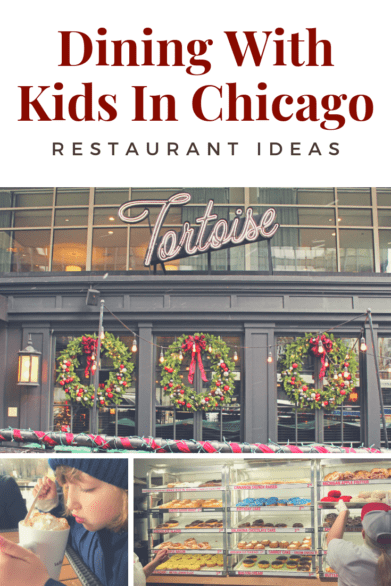 Get some more ideas by following my Pinterest board for Chicago!